The Rodeo Collection Round Twelve Light Chandelier lends luxurious modern style to your home. Inspired by classic rustic lodge chandeliers, this handsome large chandelier design makes a wonderful accent for seating areas or entry halls. It features a bronze finish with curved metal accents. The round frame supports twelve candelabra style lights with faux drip sockets. 36" wide x 36" high. Canopy is 6" wide. Weighs 37 lbs. Includes 12-feet of chain, 15-feet of wire. Sloped ceiling adaptable. Takes twelve 40 watt candelabra base bulbs (not included). Bronze finish frame with 12 lights, scroll accents, and faux drip candelabra sockets; round chandelier shape modeled after entryway candelabra chandeliers. Large chandelier size makes this ideal for grand dining rooms or entry areas. Can different candelabra sockets be ordered? BEST ANSWER: Hi, unfortunately we do not offer different candle covers. Can this chandelier be used in a covered porch? BEST ANSWER: No - this light was not designed nor rated to be used outside. But, I have added a helpful link to help you get started viewing other options. As long as there isn't a chance of it getting wet. It's quite large and very heavy and would have to hang from a strong ceiling as well. It's a fantastic fixture that I also had put on a dimmer. The dimmer is a must! A real showpiece in my large vaulted beamed great room. Can you use shades on this fixture? This chandelier is far more incredible in person than you can ever imagine from the picture. First the 'candle sticks' are far larger than you may think. I was shocked. At least 5in. high and large girth with perhaps 2-2.5 in. arcross the top of each one. And they aren't so much white as a rich gold color. The chadelier itself is a full 3ft. across. Vaulted ceiling are a must really, its just too tall to attempt to hang on a standard 8ft. ceiling. I hung mine in the kitchen, vaulted ceiling and it is amazing. It doesn't have any one style like western. It can adapt to any decor whether Western theme or Traditional, European, Country or even has a strong Gothic Medieval feel to it which I love with the antiques in the house. It adapts to the surrounding decor which is a brilliant style design. Looks heavier than it is but not too lightweight. Def. a two person job. I hired a professional electrian and I just assisted on the ladder holding it up until he secured it to the length I wanted, took him minutes really. And the canopy included was just enough to cover the hole the ceiling fan left so I didn't need a medallion but you can certainly add one if you want. Mostly comes in one piece, just have to put on the side decorative bars after hanging. Really beautifully desgined. I highly recommend the clear bulbs. I tried the frosted and the silk wrapped but the clear are SO much like real candle flames when lit that it transforms the whole thing. And the glass of the bulb disappears during the day almost making them look like they have wicks. Trust me, the clear are thee bulbs to use. And with twelve lights x 40 watts, make sure you have it on a dimmer and you can blast it high or dim it down for an amazing candlelight look. Mine hangs under a glass sky roof so at night the lights reflect off the glass for a cool effect. The deep iron brown patina will also bring out any other of that color metal you man have in the room for example this is in my kitchen and I have the same color iron knobs and papertowel holder etc. Just ties it all in. So consider the items that will be around it. It will be the showpiece in the room and I got mine when it was on sale for $499..SO happy with this light, one of my fav. pieces in the house. Comes packed very securely and had no breakage issues whatsoever. My first reaction was that it had a western feel to it; however in looking closer it was obvious this chandelier would look stunning in my 20' entry hall in a Tudor-style home. I have received many MANY compliments and am so glad I looked "outside the box" and made this purchase - it's perfect. I also recommend a dimmer - 12 lights can be a little bright! If you have high ceilings, DO get a pro to hang it. Was sad to replace my antique chandelier but it's wiring frayed. This piece was so good looking in my large "masculine" dining room that as soon as it went up I quickly forgot about the last one! I have high wood-beamed ceilings and this Chandelier completed the look of the room much better: Remember "Bonanza"? Uh-huh. Stands as a focal point over my dinning table,goes with my tuscan decore,rustic yet elegant.Very well crafted and great illumination. Arrived in excellent condition, my husband and I were able to install it easily in less than one hour.Very satisfied with my first time buy from Lamps Plus! I love this chandelier, it is a beautiful addition to our entryway. We installed it in a few hours, I would recommend professional installation if you have a vaulted ceiling. This product is just beautiful! As soon as we hung it, it makes the living room look even more stand out!! This product is great on a vaulted ceiling living room! it was awkward to hang because of its heaviness.actually it was quite hard.... however it couldnt look more beautiful. i have it above an 88inch beafy dining table and it looks amazing. well worth it in the end. I would use the product in my dining room. I think it is a very unique and conversational piece! I hung two of these in my great room - they are lovely! It looks great over our large dining room table. It works best over a large round table to avoid hitting your head. The delivery was prompt and arrived in great condition. No problems. love this light... my husband and I installed this fixture on the weekend. You really need to know what you are doing and its takes quite a bit of time. I question if we should have paid to have it installed. Regardless, its stunning. We placed this chandelier over our formal dinning room table. It is absolutely beautiful and it makes a statement in the room. It is large so don't underestimate its size. We also had to reinforce area where it hung from because it is heavy - so consider its weight. Great looking, showpiece, I hung this light myself with the help of my wife, very heavy and definitely need another person or two for help. Easily a $1000 + fixture in a retail store. The chandelier really does look better in person than it does on the web site. Lovely details and very sturdy looking. The price is reasonable given the quality. I am very happy with the purchase. A great addition to our entryway, a bit pricey but gave us the dramatic change that we wanted. Lamps Plus installed this item in no time perfectly! Everyone was very helpful, and nice. We love the chandler, we had a md lg space to fil love the quality and weight, heavy good look! It’s beautiful! It was a great value considering the quality and size. Looks great in my dining room! This chandelier would look great in a cabin kitchen or a house with western decor. Chandelier is ok, not very substantial, pieces are quite light. 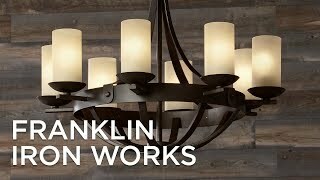 I made the mistake after seeing Franklin Ironworks on the description page that it would be of that same quality and substance. Color is a little to fake bronze, I would not say cheap but certainly would not say high quality. Would I purchase again, probably not.